Here's a short article I recently wrote for a project at university, and I thought some of you guys might find it interesting so I've thrown it up on here. And look out for Year 200X's new album some time soon! Most people would recognise the Super Mario Bros. theme tune instantly, but how about if it was played by a full rock band, complete with drums, bass and guitars? “I first got the idea after stumbling across a few Minibosses songs around 2000 or 2001. I immediately loved the concept of playing video game music on conventional instruments, but I wanted to mix in the genre that I liked the most, metal.” says Tim Lydon, guitarist of popular video game cover band, Year 200X. 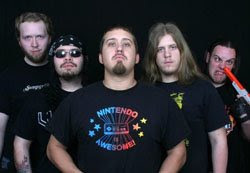 An additional two guitarists, bassist and drummer complete the Year 200X line-up, their name a reference to the Mega Man series of games. Based in Lansing, Michigan, the band is currently recording a full-length album and is set to play at the '32-bit Genocide' festival this summer. And it is gamers who make up the majority of a cover band's fan base. Having grown up listening to the music of their favourite games, hearing these tunes fleshed out by a full rock band is quite appealing. Paying tribute involves playing the original material accurately, although this can sometimes be a difficult task, as the music was never intended to be played on traditional instruments. However, one technical aspect of old video game music does lend itself to a rock band setting: “the NES soundchip basically produced four tracks, and they were often utilized as two 'lead' tracks, a 'bass' track, and a 'noise' track that was usually used for percussion or sound effects. It's almost a no-brainer that these would translate well to two guitars, a bass guitar, and drums”. Nerdapalooza UK Saturday June 14th!